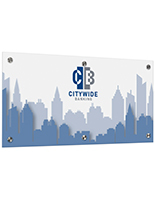 Our line of custom acrylic signs allows you to personalize the signage and art in your home or office with absolute ease! Looking to add a modern touch to your business’ lobby? Trying to bring a calming feel to a doctor’s office waiting room? Searching for the perfect way to display your family photos? Amping up branding efforts in your retail space? 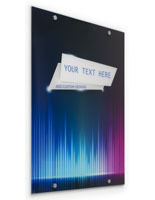 No matter your reason for purchasing custom acrylic signs, know that the high quality panels, expert printing processes, and modern mounting hardware included in each display promise to give you a fantastic piece of wall art that will last for years to come! These signs are made in-house with our state of the art UV printer. 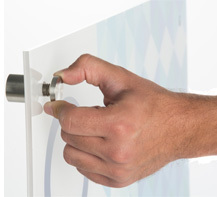 The printer deposits ink right onto the surface of your acrylic sign, drying it immediately with UV lights, so the ink stays its sharpest and most defined. This process allows you to print any high resolution photograph in the highest quality, perfectly preserving every detail and pixel of the piece. From family photos to custom quotes to wedding collages, any photograph will look great when printed on one of our custom acrylic signs. 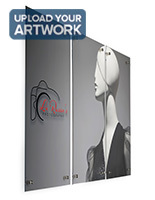 Because our UV printer allows for total precision, you can choose unique business logos to be printed on the plastic panels as well. 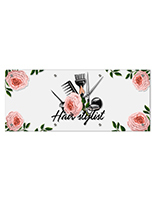 Choose to keep the background of the acrylic panel unprinted for a modern and glossy look surrounding your logo. 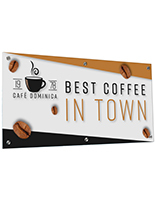 Plus, nothing is more beautiful than seeing a large custom acrylic sign as soon as you walk into your business entrance. 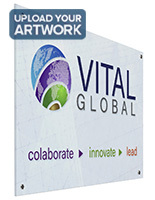 Made of laser cut acrylic, our signage with custom graphics will make your brand name and logo pop right off the wall! Additionally, our printing technology features second surface printing to keep your personalized graphics safe from scratches or discoloring. 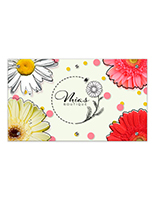 Printing in this style also keeps photos from fading, while the glossy layer of acrylic over the top of the print allows its colors to truly pop! Each acrylic wall sign arrives at your door ready to hang! Every model comes with sign standoffs, which are small pieces of hardware designed to go through the edges of your art and into the wall behind it, holding the art panel about 1” off from the wall. Standoffs give your acrylic prints a modern, floating effect unmatched by any other style of canvas or framed art! An interior acrylic sign will look great behind your reception desk or in your hallway - above your mantle or behind your bed. 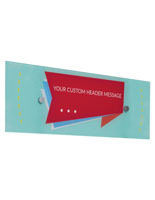 These displays are so well-made, they look amazing anywhere you hang them! 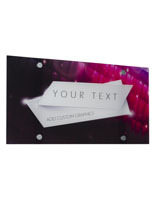 So ditch the cheap looking posters and purchase a new custom acrylic sign for your company or house today!